General Information: A member of the cabbage family, turnips are similar in appearance to such root vegetables as rutabagas and swedes (originally Swedish turnips). In general, turnips are smoother than these cousins and have several circles of ridges at the base of their leaves. For cooking purposes, they can an be used interchangeably. Turnips were originally called "neeps," from the Latin word for turnip, napus, which also gave rise to the French word navet. The prefix turn refers to their spherical shape. The yellow globes keep well and, with a taste similar to rutabagas, are nice for cooking. Vilmorin described this variety in 1879 as "Skin very smooth and quite yellow; flesh yellow, softish, and fine flavored, ... highly esteemed in Scotland and the north of England." History: Turnips have been around a long time: they were enjoyed by Greek epicures (who favored those from Thebes) and by Roman gourmets (their turnips had to be from Amitermes). In one Roman dish, turnips were presented in sixteen different colors, though the favorite, by far, was purple. In the Orient, tender strips of turnip make a quick and delicious stir-fry. 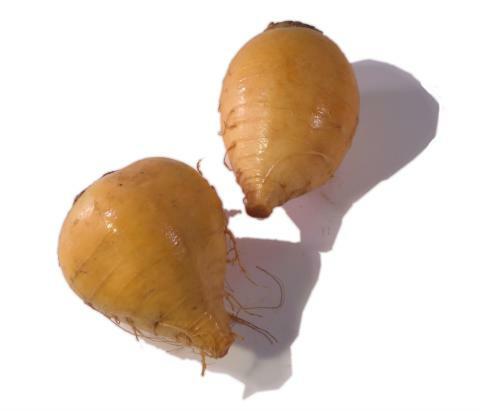 But no discussion of turnips is complete without due homage to the man they called "Turnip" Townshend, who, in the early 1700s, introduced a bevy of unknown Dutch turnip varieties to England. Although his efforts had beneficial effects on the way people thought about turnips, they also (unfortunately for "Turnip") changed the way people referred to the man who brought them. He had been known previously as "Lord" Townshend.